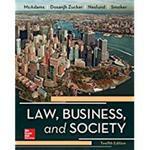 Law, Business and Society, 12e fits both upper-division undergraduate and masters levels courses in the legal environment of business, government and business, and business and society. Law, Business and Society, takes an interdisciplinary approach, using elements of law, political economy, international business, ethics, social responsibility, and management. Students will find an interesting, provocative reading experience filled with contemporary legal and ethical conflicts emerging from today’s news, as well as scholarly results, surveys, polls, data, anecdotes, and other specific details that lend credibility, immediacy, and interest to the reading experience. McAdams, Tony, "Law, Business and Society" (2018). Faculty Book Gallery. 466.